Preheat oven to 350°F. Spray 9-inch round cake pan with nonstick cooking spray. Drain pineapple; reserve 3/4 cup juice. Place pineapple rings evenly in bottom of prepared pan. 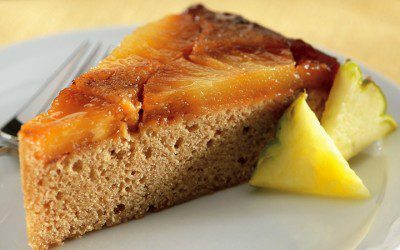 Drizzle molasses evenly over pineapple. Sprinkle with cinnamon. Beat sugar substitute, margarine, egg whites, and vanilla in large bowl with electric mixer at low speed until well blended. Add reserved pineapple juice, flour and baking soda; beat until smooth. Pour batter over pineapple. Bake 30 minutes or until toothpick inserted into center comes out clean. Cool in pan on wire rack. Store leftovers in refrigerator. Tip: For maximum flavor, let cake sit overnight before serving. Serving size: 1/12 of cake.